there is no GPS. Just like the WiFi iPad v1, this tablet is not able to give your position on its own. there is no 3G connectivity. You'll need to use WiFi to access the internet. On the go the best option would be to use a Novatel MiFi 2352 (€185). there is only 8GB of storage + a Micro SD slot. Since you can buy 16GB SHDC class 4 for €30, I don't think having only 8GB is an issue. it cost only €237. The competitors are priced at €500 for the 10" iPad WiFi 16GB and €600 for the 7" Galaxy Pad 3G 16GB. There is no such thing as free food, for half the price of an iPad I don't expect the same quality. it weights only 300g. The iPad weights 680g and the Galaxy Tab weights 380g. the screen viewing angle is narrow, the light falls off pretty quickly both on the top and the bottom... it smells like a bad TN panel. the screen seems to be made of plastic. This helps with the weight but is probably the cause of the next issue. the screen and digitizer complexing is poor. It shows Newton rings that are annoying in low light. the screen is reflective. Get ready to see yourself a LOTand eventually change your name to Narcissus. the screen is not oleo-phobic, as in this thing is a smudge magnet. the screen backlight is not homogeneous. the VGA webcam is a joke. My first webcam had both a better image and a better frame rate. the basic Google apps are missing. You'll need to copy over USB the gApps4Archos package and then launch the install of Maps, Gmail, Google Talk, Market and Youtube. the 4 basic buttons are software buttons. Therefore they waste screen real estate, they are not as responsive as their hardware counterparts and they get in the way of some apps lower controls or text (Opera Mobile, Kindle, Spotify, Aldiko...). the image resizing comes with lots of blur and artefacts. This appear in both when images are zoomed out and zoomed in (web browser, Evernote, photo frame, ...). I haven't seen that amount of resizing artefacts (dithering) in more than a decade. To make things worse, the image is blured (filter) as soon as you remove the fingers from the screen. It seems to be an Android apps feature (dither and filter properties). both the Music and the Video apps can have trouble finding DLNA servers. It looks like I have too many DLNA servers on may LAN (in this case 5 devices). I had to shutdown my Sonos players to be able to see my DLNA NAS. the Music app doesn't display the album art included in the MP3 from my DLNA NAS. The same file on the SD card works as advertised. the Photo app takes almost 30s to fetch a 225kb image from Picasa over a 12MBps DSL. It is so slow that if you launch the diaporama, all you see are the enlarged thumbnails. the sensitivity of the screen is far from perfect. I found myself having to type multiple time to get one character. After more than 2 years of practice, I master the 2 thumbs entry on soft keyboard. I can't say if it's the plasticky screen or the stock Android keyboard. I tried the keyboard calibration with no luck. you often see apps crashing on exit. Android then asks your confirmation to kill the app. every once in a while you'll need to reboot the device because one app is draining the ressources. the screen density is not high enough to be able to display PDFs properly in portrait orientation. it uses Android. Of course it's still Android 2.1 (Eclair)... I'm looking forward testing Android 2.2 (Froyo) SOON. it does over the air updates... the idea of non using iTunes makes me warm and fuzzy. it has a back button. This is one of the basic features missing on the iPhone. the Android notification system put Apple, Steve Jobs and the iOS devices to shame. the 7" size and 300g seems to be the sweet spot for me. I have large hands so I can easily hold it in one hand. I can use both my thumbs to type in portrait mode. my 5 years old daughter enjoys watching cartoons on the portable screen. The Movie player support the containters, codecs and subtitles that matter to me (avi, mkv, h264,...). being able to access music, photos and movies using DLNA (when it works properly) is a huge step from iOS. It's still unclear if I'll keep this Archos 70 8GB. 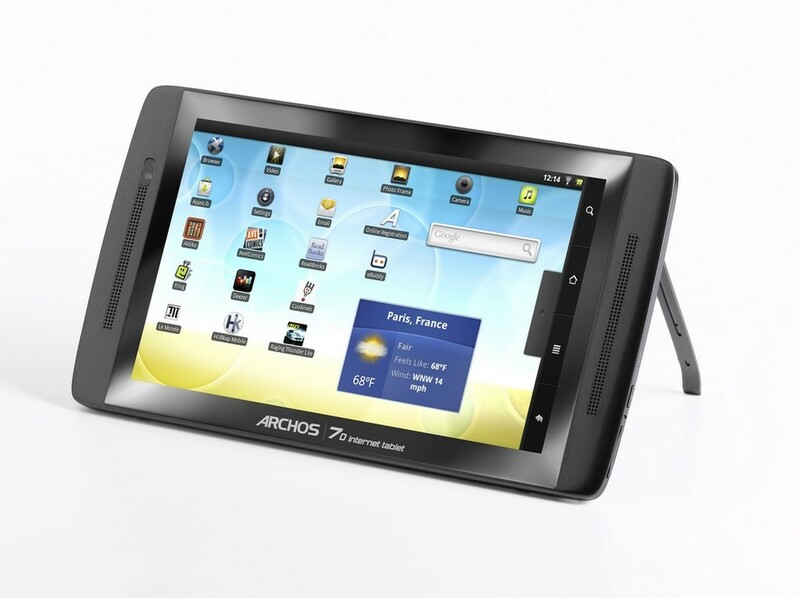 I'll contact Archos support tomorrow. They were supposed to offer the Froyo update in november 2010 (2 days left). If they can't give a release date, I'll return the Archos 70 and ask for a refund.